The 49 year old former Russian captain of the "Karin Lehmann" was sentenced to 35 days imprisonment at the Stavanger City Court for being drunk at the helm. Three hours after he was found intoxicated, he still had 2.48 per thousand blood alcohol. In addition the man was forbidden to guide ships in Norwegian waters for two years. In court the man had admitted having drunk 3.5 deciliter of vodka the night before he went on duty, but he denied that he was drunk when he steered the ship. The Court believed, however, he must have been drinking a lot more. The man was in custody until, on Aug 22, the case was to be dealt with at the Stavanger District Court. Four witnesses, among them representatives of the Coast Guard who approached the ship because it kept the wrong course, a pilot who was sent to the ship and guided it to port, where the captain was arrested, and one of the police officers, were heard. Police have carried out a judicial examination of the chief officer, and the results of the hearing will be announced during the main proceedings. The captain's lawyer, Kim André Svenheim, said that his client denied being guilty. Karin Lehmann arrived Tananger instead of Stavanger yesterday. The master onboard was drunk and the pilot decided to take the vessel to the nearest harbour. The police was on the quay in Tananger when "Karin Lehmann" arrived, ca 12.00 local time, Jul 29. 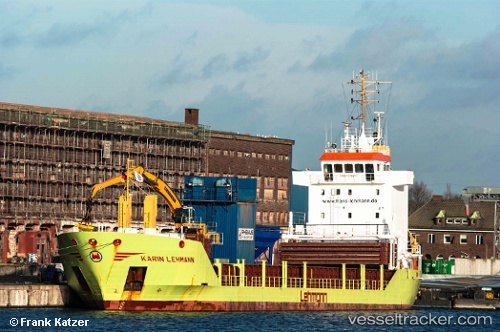 The vessel is still in Tananger at Jul 30, 08.00 local time.